I’ m on the fourth day of the Master Cleanser-a fast consisting of ingesting nothing but lemonade, maple syrup, and cayenne pepper. So far so good, since I’ve made it past the dreaded day #3 -where you generally feel lousy from the detox process. 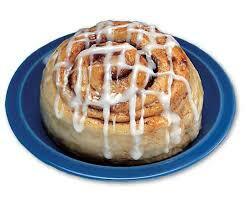 The only thing that almost sidetracked me was seeing this huge cinnamon roll in the refrigerator! (thanks, Xiomara!) Other than that, smooth sailing.